If anyone can claim the title of “Queen of Sci-Fi,” it must be Zoe Saldana. She has starred as Neytiri in Avatar and Uhura in Star Trek. Now she’s about to return to the big screen as Gamora in Marvel‘s Guardians of the Galaxy Vol. 2. When we visited the set in April 2016, it wasn’t known if she’d appear in Avengers: Infinity War. Now that it has been announced, her appearance with her adopted father Thanos promises to be one of the most dysfunctional family reunions in the Marvel Universe. But first things first. As we met Saldana in full Gamora makeup and costume, she was friendly, funny, and excited to bring more girl power to the big screen. Q: So we just talked to Karen (Gillan) and she was talking about how we’ll probably see more of an empathetic side to Nebula. Can you talk a little bit about maybe seeing like a darker side to Gamora as we get to their history and relationship with Thanos? Zoe Saldana: I just don’t know how much, how darker Gamora can go. You know, when you started with her in the first film, she’s like full-blown assassin. And with a lot of bad habits. Who through the friendship that she initiates with the Guardians, like it just, it compels her to sort of turn on a, turn a new leaf, is that the way you guys say it in English? So in this movie, I don’t know about her being like a total like b*tch, you know? I think there are some sympathetic values to her character that she’s gonna try to sort of incorporate. When it comes to her relationship with Nebula, I appreciate what James Gunn did. He definitely heard what the fans were saying, you know. To see this relationship extensively unfold and see what they’re about and, I mean, but through their relationship you getting like a closer idea of what Thanos is really about. I think it’s really interesting to open up that window. And he certainly has with this sequel. Q: How will we see their dynamic change into this movie? Saldana: Their dynamic, I think it’s definitely volatile when it starts. Which is to be expected. And then you’re gonna go in depth into understanding where they’re both coming from, which I find really interesting. And I can’t wait for you guys to see it unfold. Nebula’s definitely a tough cookie, man. And she has a lot more issues than Gamora does. I mean, I guess I just feel like Gamora at least has friends. You know, Nebula is just she’s just lethal and Karen really delivers in this movie. More than she did in the first one. I mean, she was so good in the first movie that James couldn’t kill her off. He had to find a way to bring her back, which I really appreciate. Q: So what do you get to do that in this one that you didn’t get to do in the last one that’s really exciting? Saldana: You know, the stunts here are much more defined and they’ve been a lot more challenging. So I’ve been having fun, especially after like popping twins like 17 months ago. The fact that I could get on wires and be lifted 30 feet up in the air at full speed or just be dropped and landing on heels that are this high, I love the fact that they’re trusting me with this. And I’m having a lot of fun. That and I always have fun with action scenes. I get to have a sister on screen. I don’t think many actresses can say that about the characters that they’re playing in films lately. So Karen and I really appreciate the gesture. Q: You got some upgrades, new weapons, new cool stuff? Saldana: I don’t know, man. I find, I’m a huge believer in that saying that if it isn’t broke, don’t fix it. So we weren’t broken when it came to our fighting abilities. We’re really stealth. So I think I’m gonna stick to the swords. It’s a pretty f***ing awesome sword anyway, so it’s heavy. Q: How does Gamora feel about J’son (the temporary name of Kurt Russell’s character)? Saldana: You know, he has good hair. (Laughs) That’s as much as I can say. Q: How does Zoe feel about Kurt? Saldana: We Tango, was he Tango? Tango and Cash, come on people, I’m an ’80s kid. I love all my cheesy ’80 movies. Q: He’s Jack Burton to us. Q: Big Trouble in Little China. Saldana: Oh no, I’m confusing another movie. Sorry, I barely sleep. Q: Don’t worry, it’s all on record. Saldana: Okay. (Laughs) But I do love Big Trouble in Little China. I am a fan of his. To get to work with a veteran of that scale and I’m really humbled. And he’s fantastic. An incredible human being. And I’ve been also a great fan because he’s always been someone we’ve always talked about, my family on about being a good Father. A really good man to his family. So I get to work with a decent human being. I’m really happy about that. When you get old, you know, your time starts to mean everything to you. So how you spend it and who you spend it with is very important. And if I’m gonna spend 16 hours of my day at work, I better be f***ing spending it with great people. And Kurt Russell is a great person I have to say. Q: One of the things that Chris was saying was that when they first wrote these characters, they didn’t have actors in mind. And this time coming back they had some of your voices and were able to help use that to develop the characters some more. So do you see that in what they brought to Gamora this time? And are they playing off of you more? Saldana: Yeah. There’s a lot more freedom that James is giving himself in letting us kind of improvise. And kind of test how well we know our characters and how well he wants to push us as our characters. And we’ve been having a lot of fun. So obviously Gamora’s not known to have a sense of humor. So that has been a challenge for us. But we’ve been enjoying experimenting with her and seeing what he’s gonna be able to keep in the editing room. It’s always a treat. Q: They said at the beginning that they’re almost arrogant. Like they’re conceited ’cause of their success. Saldana: They’re super yes, and they’re so annoyed with each other. (Laughs) And oh man, I love them to pieces, these characters, but if I had to like be roommates with them, I don’t know what I would do. Like in a cruise ship stuck with like Peter, Drax for the love of God and Rocket. Q: What about Groot, Baby Groot? Q: They feel like a team that really cares about each other. Saldana: Yes, through the way they put each other down. (Laughs) Which I think it’s great. I think it’s a really interesting twist, because what James established is a perfect friendship because our fall, our flaws is what makes us love each other more. Or at least accept each other more. Q: Your makeup, it looks like Gamora has run afoul of somebody. It looks like there’s some bruises here and here. Can you talk about who maybe has laid some blows? Q: Can I translate this to is this the opening scene when you go to…? Saldana: Not at all, you’re not even close. You’re not even close. (Laughs) But you can say that. Saldana: Just all I’m gonna say is… (Looking at the publicist) He’s like, “I’m right here, Zoe.” Damn it. It’s really good. We about the vacation for the weekend, technically I’m right about that. I think our host ends up being like an, you know, so that’s all I’m gonna say. 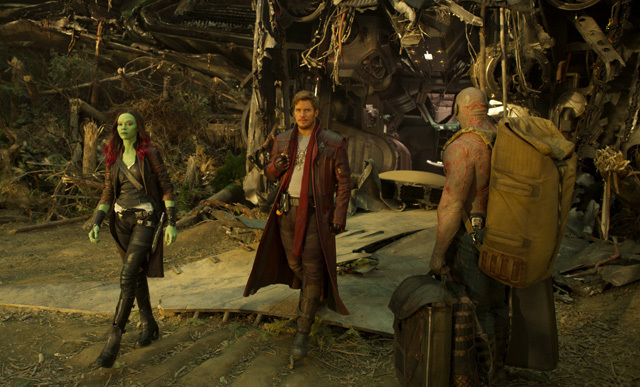 Q: In the first movie, Gamora was sort of, as the team was coming together, Gamora was sort of the sense of let’s do the right thing. Q: I was gonna ask with new characters coming in in this one, does she still play that role? Saldana: Yeah. But we’ve, we’re keeping, we know where that line is her turning into like a Mom a lot, you know. And her just being just a meticulous, detailed, professional individual. But now it’s like okay, if we’re gonna be sort of like bounty hunters or whatever it is that we’re gonna do in the universe, let’s just establish some rules and let’s stick by it. Like what’s your title? What’s your title? She’s definitely like really OCD about that. Hasn’t changed. I think it’s gotten worse. She should probably go talk to somebody. But she’s… she is their moral compass. Still is. Q: Speaking of roles and rules, what are the roles between Peter and Gamora this time. There was a will they, won’t they vibe in the first film. Is there some connection? Where does it go here in Volume 2? Saldana: They’re becoming a really good team. In the way that like oil and vinegar are. (Laughs) Where it’s good together, it tastes good together. But they tend to still stick to their own things. And I think Peter may have gotten a little more annoying. (Laughs) And Gamora’s just a little too rigid sometimes. So through the dynamics that are happening around her, she learns to relax. (James Gunn walks up behind her.) By the way, you guys, let’s talk about our director. Saldana: (Laughs) I didn’t say anything. I said it’s like a Weekend at Bernie’s. Saldana: Anyway, our director’s like a genius. (Laughs) He is. Q: How’s Volume 2’s soundtrack? Q: We heard some of it today. Saldana: You did, right? It’s amazing. Q: You said you’re an ’80s kid. Do you approve of everything that’s…? Saldana: These were songs that were already like classics by the time I was listening to music. I came from like Borderline, like Madonna and things like that. But listening to these songs while I’ve been working on Guardians and on these two movies has gotten me to know that I did hear these songs growing up. And they did leave a mark. Q: Do they get stuck in your head? Q: Which one gets stuck in your head the most? 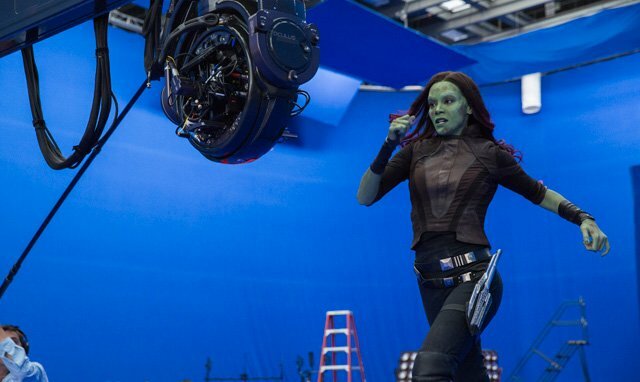 Q: Gamora and Nebula work out a lot of issues in this film. But actually I feel like they’re gonna wanna go take some of those issues to their Dad. Do you feel like this movie pushes that forward and that could be the next iteration of their journey? Saldana: It would seem like the logical thing. We’ve been, don’t be fooled by this, but despite like all how fun it is to get to get paid to come do a Marvel movie where you play a green alien, we do try to seek some truth to what these individuals have gone through. And it’s not difficult to find parallel scenarios that we can sort of empathize with. So we’re living through times right now with so many refugees fleeing from their homelands, trying to better their lives and just survive in other lands. Like these are orphans. They’re all orphans. They were all either taken, abused, forced into a life of violence. 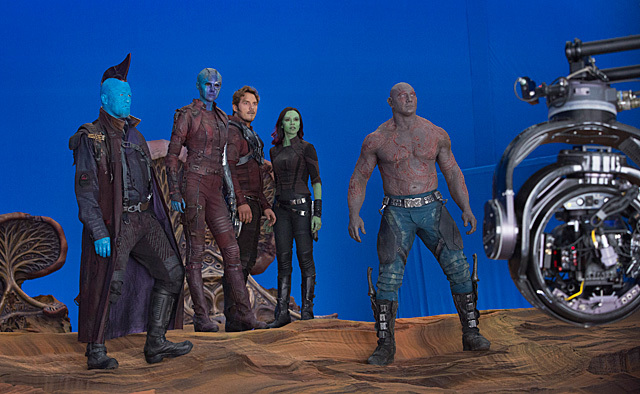 So once you kind of take away all the comedy and all the special effects and everything, the Guardians it just seems like a group of runaways that try to find a good, a reason to stick around. So that’s how this movie and what James Gunn has created and the story he’s given each and every one of us like he just has my heart for life, because you can very well wrap something like this, like a Marvel movie and make it so superficial that a knife couldn’t cut through you. I mean, you’re just so insensitive to anything. It’s all about jokes and punchlines and muscles and lubricated muscles and good shots and bigger muscles and other sequels and great f***ing hairdos that never come undone. And nobody cries. Nobody bleeds. Nobody feels a tremendous loss or void. And these guys are aching all the time. And they’re trying. They’re just trying to not be so f***ed up. Every day they’re trying not to do one, they’re trying to do one bad, one less bad thing. That’s like from hurting themselves or hurting somebody else or doing something that will just get somebody else hurt. Like they’re just, they’re trying ’cause they’re *ssholes by nature. They’re really like, they’re just jerks. Q: Obviously we don’t know where Gamora and Nebula will come down and they’re sort of coping and dealing and talking through their traumas in the group with Thanos at the end of this movie. But do you think like if she heard, hey, this whole crew of people is getting together and trying to stop Thanos, do you think like is that a fight that she would ever sit out of? Or do you think that she would be like no, count me in, I need to get revenge? Saldana: I think Nebula is definitely like that one kid that you have that no matter what you do you can put them in the best schools, they’re still gonna be super f***ing *ssholes. Q: What about Gamora though? Saldana: And sorry for cursing, I just, I can’t curse at home, so he’s like I’m gonna make you laugh. I’m like you’re freaking me out. But she’s just that person that I don’t even think if all of us were to tell her we’re gonna help you, maybe she might say and then she’ll just but she’ll be like okay and then she’ll bail. Eventually. I think that what she feels in her heart is probably really, really serious. And it’s gonna take a lot of love to melt her ice, you know. That’s just my assumption. Q: Do you think that she’d want to be a part of that fight though? Saldana: I mean, does a bully want friends? Of course. Q: So I know Marvel does everything really secret and this is hypothetical only, but in a hypothetical world where the Guardians met the Avengers, what Avenger do you think would be most interesting to see Gamora meet up with or go up against? Saldana: Or should I just be more specific? Mark (Ruffalo). He’s my “Infinitely Polar Bear.” Thanks. Bye, you guys.